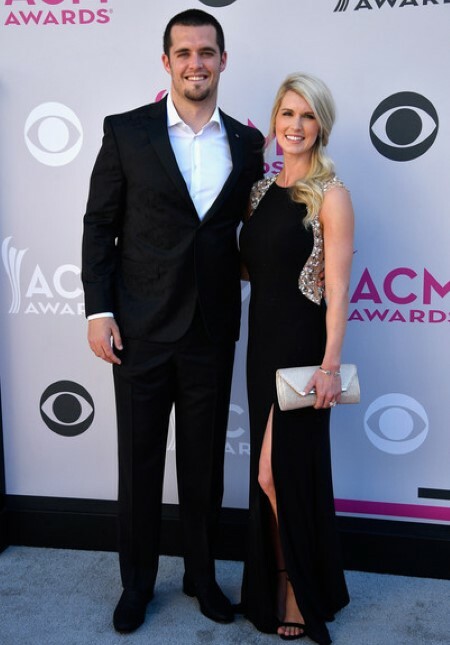 American Football Quarterback Derek Carr' Wife Heather Neel Helped Him Built His Career-Find Out How? Home Article American Football Quarterback Derek Carr's Wife Heather Neel Helped Him Built His Career-Find Out How? American Football Quarterback Derek Carr's Wife Heather Neel Helped Him Built His Career-Find Out How? One must be really fortunate to bump into a special person who brings joy in both personal life and professional career. 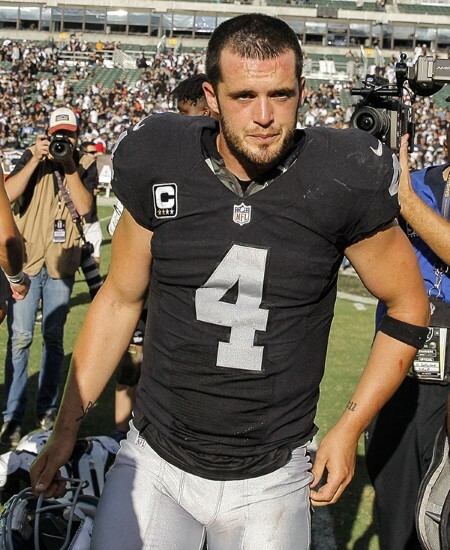 Derek Carr undoubtedly belongs to the fortunate minority who ended up sharing wedding vows with an amazing lady who filled him with nothing but happiness and helped him gain success in his career. Carr probably needed the extra push to ensure his career would take off towards the path of success and thankfully it was the love of his life who provided a helping hand to change his ways for the better. 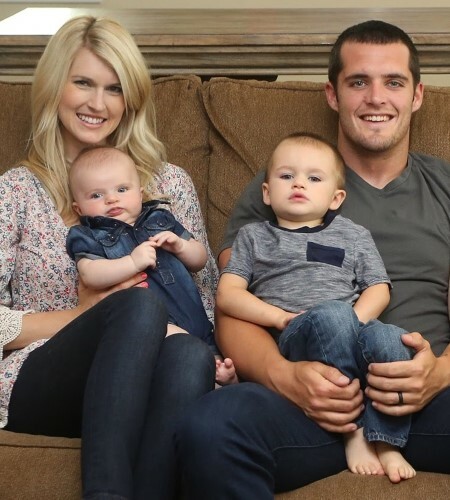 Derek Carr is married to his beautiful wife Heather Neel. The couple tied the knot in 2012. The pair first met while Heather was working as a waitress at a Brewhouse in Fresno during her high school and college days. She did so in an effort to bring in money while completing her studies. At the time Neel probably had no idea she would end up meeting the man she was going to marry. During one of her shifts, Carr was one of the customers who asked her why she wore only one earring. Heather was surprised and worried that she might have lost one of her diamond earrings. Neel went off to check them and realized both of them are in place. As it turned out, Carr was simply messing with her to grab her attention. The pickup line ended up working perfectly as Neel went back and talked with him. Soon after, they went out on a real date which kickstarted their relationship. The love story blossomed and the duo took the next step in their relationship by exchanging wedding vows on 10th July 2012, officially turning Heather Neel into Heather Carr. The couple shares two children together. Their first child, a son named Dallas Carr was born in August 2013. Unfortunately, Dallas was born with issues that were far from normal for an infant. The couple discovered that their son's intestines were tangled. The baby needed three surgeries and it was unclear if the baby would survive. Thankfully, Dallas survived and now lives a normal life for a 5-year-old. The pair welcomed their second son named Deker Luke Carr in 2016. The couple is currently living a blissful married life and it remains to be seen if they decide to add further bundles of joy in the near future. Although it seemed like Heather had the perfect thing going back when she was dating one of the most well-known athletes at Fresno State, things were far from perfect in their relationship. The reason for the dispute was the fact that Heather was a devout Christian who lived by her faith every single day, while Derek was the complete opposite. Carr was always more interested in living the life of a college partier than being a religious kind of guy. Apparently, Derek had earlier told Heather how much his faith meant to him. This later turned out to be a lie and something she could not accept. Subsequently, Heather wrote a letter to him where she essentially said that Derek Carr whom she met and the Derek Carr who turned out were two different people. Moreover, if he wanted to stay with her, he had to fix this immediately. "Had the last name, a quarterback and (figured), 'I'm going to someday take the program over.' He was reaping everything he could. God had to straighten him out." Heather ended up straightening out Carr as he left the party life behind. This helped him develop into a top quarterback for the Bulldogs. Born on 28th March 1981 in Bakersfield, California. His parents are Sheryl Carr and Roger Carr. He has two sibling brothers named David Carr and Darren Carr. His elder brother David was also an NFL quarterback, selected first-overall by the Houston Texans in the 2002 NFL Draft. He attended Clements High School in Sugar Land, Texas. He plays as Quarterback who was selected 36th overall by the Oakland Raiders in the 2014 NFL Draft. He won the Mountain West Conference Player of the Year twice at Fresno State. He played three seasons at Clements High School in Texas. He spent his senior year at Bakersfield Christian High School in California. His net worth is estimated to be $20 million.